The use of design patterns in enterprise-level businesses can significantly increase the certainty of the R&D team, save unnecessary design and maintain system consistency, allowing the “designer” to focus on creativity where it is most needed. Design patterns adhere to Ant Design design values and provide a general solution to recurring design issues in enterprise products. The designer can directly use the design pattern to complete the interface design, or the design pattern can be used as a starting point to derive a more business-specific solution to meet the individual design needs. 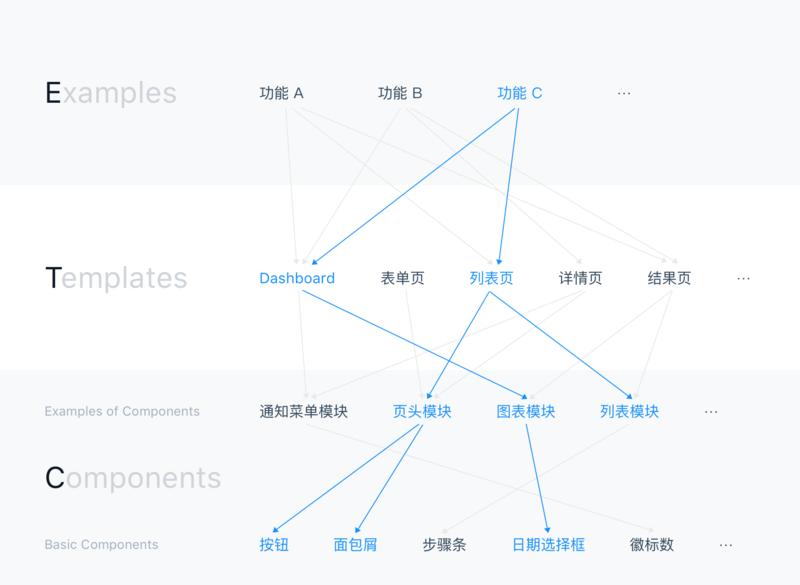 At the same time, this is a dynamically updated design document, and your reading and feedback is the driving force behind our progress, Github Feedback Address. Function example: Consists of multiple templates to inspire users how to use and build a common feature. Template: A page-level example that inspires users how to build a typical page in a system, such as a detail page. Component - Basic components: The most basic elements of the system, such as buttons and pagers. - Business components/modules: Block-level examples, typically consisting of multiple components, such as the PageHeader generic header. General concepts: Some conventions that guarantee ETC systematization, such as typesetting, fonts, and copywriting. We work with engineers to transform design patterns into reusable code that maximizes your productivity and communication efficiency. Ant Design Library: Axure resource packs are included with the code to make your prototype look like a visual draft, including templates, components, and more.